An Garda Siochana in Buncrana are appealing for information following an aggravated burglary in the town last night, Tuesday,December 1. At approximately 1am, four men, one of whom is reported to have been carrying a firearm, entered a house at Mill Lane in the town and confronted a mother and her four children. 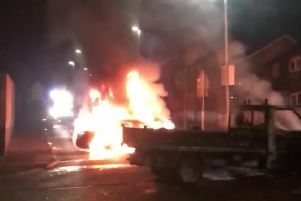 One of the children was injured during the incident and was taken to Letterkenny General Hospital and has since been released after receiving treatment. Inspector David Murphy has told the ‘Journal’ that “considerable damage” was caused to the property during the incident. Gardai say that all four of the assailants were armed with various “implements” and that they are seeking assistance in tracing a white high roofed Transit van with the possible registration number beginning VUI. Following the incident the van was seen to travel away from the town in the direction of Slavery. Inspector Murphy said that the incident is being treated “as a very serious crime” and that Gardai are seeking the assistance of the public who may have witnessed anything in relation to the events in question between 12.45 and 1am in the Mill Lane/Tullyarvan district. Witnesses are urged to call Buncrana Garda station on (00353)-0749320540 or the confidental line on 1800 666 111.